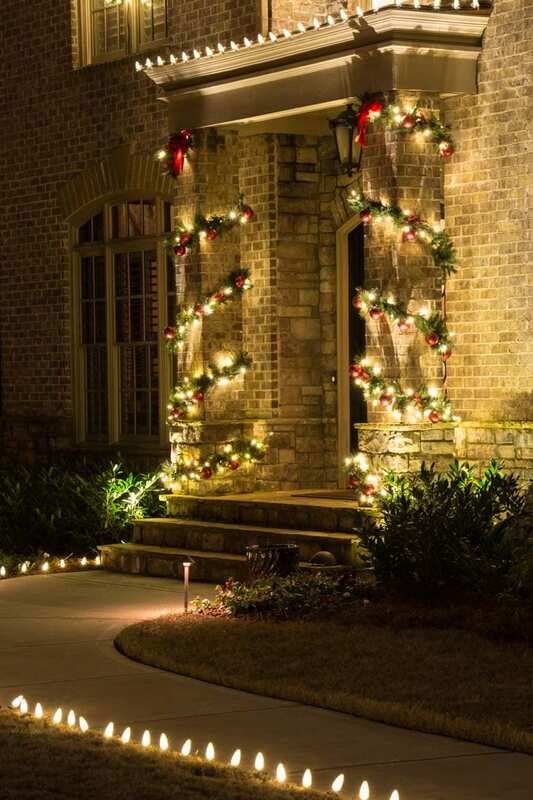 NightVision Outdoor Lighting is your Atlanta Christmas lights installation specialist. Our Christmas lights installation team can design a display to make your home sparkle this holiday season. Our professional landscape lighting experts in Atlanta will bring festivity and holiday cheer to your home’s appearance. From a simple wreath on the door to elaborate homes drenched with light, decorating is a cherished holiday tradition. Many people enjoy driving through different neighborhoods around the holiday season to admire the homes adorned with lights. We may not get much snow here in the Atlanta area, but that doesn’t mean your house can’t look like a scene from a Christmas postcard. NightVision can design a exterior lighting display that will make your home admired by all who pass by. Contact us today to see which options are best for you. The holidays are right around the corner, so be prepared today! Although most people enjoy the beauty of landscape lighting in Atlanta, homeowners tend to be less enthusiastic about the decorating process itself. Untangling strings of lights can be so frustrating, and dealing with precarious ladders is nerve-wracking and dangerous. Worst of all, after going to all of that trouble to hang up your decorations, you have to go through it all again when the holiday season comes to a close. Then the decorations take up storage space for the rest of the year, until it’s time to repeat the whole ordeal. When you choose NightVision Outdoor Lighting to set up your exterior lighting, we do all of the hard work for you. You will not need to deal with any tangled lights, ladders, or any trouble at all. We will take care of all the installation and take everything back down at the end of the holiday season. NightVision will even store the lights for you until next year, leaving your storage space free for other things. Check out our blog for more seasonal lighting tips and bright ideas. Our holiday lighting is always beautiful to behold, and can be designed to reflect your personal style taste. Whether you want to turn your abode into a lit-up gingerbread house or simply incorporate a few sleek lines of light, NightVision Outdoor Lighting is prepared to meet your Christmas lighting needs. NightVision uses only the highest quality lighting fixtures. Our lighting components are the best in the business. We will design and install your holiday lighting to your complete satisfaction, as well as disassemble and store the display when the season is over. We are confident that you will be pleased with the ultimate outcome of our work. Contact us today to begin your Christmas lighting project with our experts at NightVision Outdoor Lighting. It’s not too late to prepare for the holiday season!